Sharp Angle is another generic advertising-supported application from already notorious developer SuperWeb LLC. We advise that you remove this application because it does nothing but display various advertisements. This app promises to improve your online browsing, and especially shopping, experience which is another way of saying that you will have to put up with a huge amount of commercial content on your browser. You might run into these ads everywhere, especially on such online shopping sites as Amazon, Ebay, BestBuy, and others. If you want to stop all the pop-ups, in-text ads, banners, and other clutter, showing up on your browser, you will need to delete Sharp Angle from your computer. The commercial content is not only annoying but also unreliable as Sharp Angle can send even untrustworthy links to your screen. If you click on these links, you will be immediately rerouted to corrupted sites that host Internet-based infections. Even though Sharp Angle is promoted as an application computer that users will find useful, it is actually dangerous; thus, you should remove this app because it might play a part in infecting your machine with malware. Sharp Angle is also known to utilize a high number of various tricks to record information about your online preferences and to use this data to select ads which are shown on your browser. Although it seems as this adware application works for your benefit, the content it shows will rarely improve as time goes on. Moreover, if you fail to remove this application in time, this application might be taken advantage by suspicious parties to collect sensitive data. One of many things that Wooden Seal, Water Plant, Web Amplifier, and other applications from the SuperWeb family have in common is that they are almost never accessible via their official sites (sharpanglesystem.com). These applications slither on target computers together with other programs via so-called software bundles. So, if you did not download Sharp Angle directly, which is even not possible at the moment, it is highly likely that you installed it accidentally with other software. This adware application might not necessarily spread only with legitimate software; on the contrary, it might be possible that you will need to remove Sharp Angle and additional malicious applications. 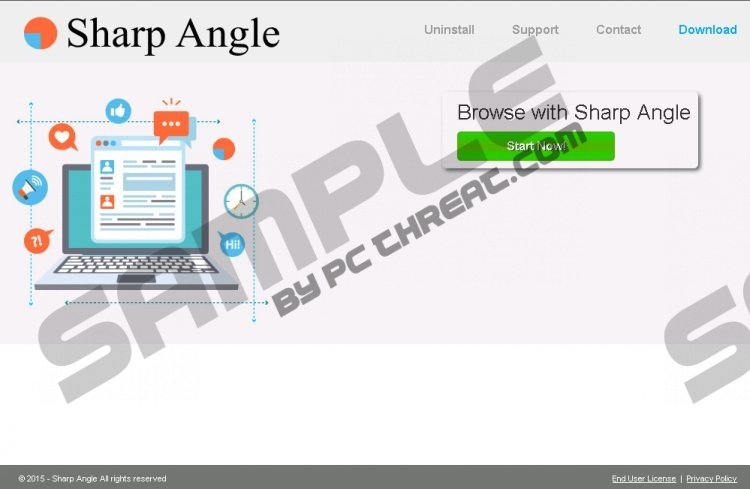 Sharp Angle is an adware application that you will be able to delete from Control Panel. If you feel like you are not experienced enough a computer user, follow the instructions we have prepared exclusively for you. However, the most secure way to delete Sharp Angle from your system is to acquire an automatic antimalware tool and scan your machine. Keep this tool active all the time and you will never have to deal with risks threatening to undermine your computer’s security. Quick & tested solution for Sharp Angle removal.